Tracking dogs and their Maasai handlers are helping to keep wildlife and people safe in northern Tanzania—and word of their effectiveness is spreading. Sunday morning had just broken on the northern Tanzania savanna when the phone rang at the Manyara Ranch K-9 unit. Fidelis Olekashe, a security expert who manages the 35,000-acre ranch, had been asked to investigate a theft. Money had been stolen just hours earlier at a nearby safari camp while guests were out on a game-viewing drive. He was calling for back-up. Olekashe, who previously served in the Tanzanian military, was recruited two years earlier by the African Wildlife Foundation (AWF) to help curb poaching in this important wildlife corridor that connects two of Tanzania’s most iconic national parks, Tarangire and Manyara. But as the phone call illustrated, poaching is not the only variety of crime Olekashe fights. And quite often he enlists the ranch’s highly trained tracker dog teams to help him in this work. At his request, two dogs and their handlers were already on their way, escorted by uniformed rangers. After a few minutes, one of the handlers leads a striking maroon-red Alsatian named Rosdaz, its nose to the ground, to the area between the tents and from there, to an open-air kitchen. Here, the handler directs five camp staff members and about 10 others, including me, to stand still as he presents the dog with one of the pieces of gauze. After a few sniffs, Rosdaz matches the scent to one of the staff members; the dog stands up on his hind legs and places his front paws firmly against the man’s waist. The man, dressed in a crisp, collared shirt, stands motionless and stares straight ahead, avoiding the gaze of his accuser. As we wait, Kalasinga directs us to form a circle and stand far enough apart so the breeze won’t blend our individual scents. Londasat appears with Rocky and hands his lead to Kalasinga. After being presented with the first piece of gauze, the dog makes his way around the circle and stops at the same man Rosdaz had identified. Instead of jumping up on the man, he simply sits beside him and barks. It’s a noisy signal compared to the passive cues that dogs trained to detect various types of contraband in public places give their handlers. But these are not detection dogs; they’re trackers, trained to pursue and to make noise when they locate their target. Eventually, the scent on the other piece of gauze leads Rocky to a second man in the circle. Both of these staff members had arrived just the night before with the camp manager to provide “expertise” to the local staff. And while the positive identification only connects the men to the suspicious tracks, not necessarily the crime, the evidence seems sufficient for the camp manager to initiate a line of questioning, and to consider reporting the men to local law enforcement authorities. This type of investigation, while not the team’s primary role, is an important demonstration of the dogs’ keen ability to track down individuals—from poachers to petty thieves—who have left even the slightest clue at the scene of their crime. The methods the dog team used here are the same as those used in the pursuit of some of Tanzania’s most lethal poachers. And in that high-stakes fight, there’s little time to lose. Tanzania, which recently boasted the continent’s second largest elephant population after Botswana, lost more than 60 percent of its elephants to poaching between 2009 and 2014. Seeking effective low-tech solutions to the problem, rangers began considering using dogs to track down poachers in the bush. The use of highly trained dogs like Rocky and Rosdaz was pioneered by the Tanzanian conservation organization Honeyguide. (The organization is named after a group of birds in the Indicatoridae family that are known to lead people to sources of wild honey.) Honeyguide first established a conservation tracker dog unit in 2011 in West Kilimanjaro and was one of only a few such programs in Africa. In Tanzania’s Manyara Ranch, elephants were once the main targets of poaching. Rosdaz, elephant poaching at Manyara Ranch has been greatly reduced. On a stiflingly hot afternoon at Manyara Ranch, a young man stands just beyond the roof of a cavernous airplane hangar turning pieces of meat and bone drying in the sun. Flies drawn to the smell buzz around the rack, and curious superb starlings (Lamprotornis superbus) mill about looking for a free morsel. Once dried, the meat and bones will be ground and mixed in an enormous aluminum cooking pot with three other ingredients: sweet potatoes, lentils, and molasses. When complete, this particular batch of ingredients will yield about 75 kilograms (165 pounds) of dog biscuits, enough to feed Honeyguide’s four tracker dogs, Rocky, Rosdaz, Jerry, and Chester, for a little more than two weeks. “Sometimes the meat comes from cows that have been predated on by large carnivores like lions,” says Ole Kirimbai, the Chairman of Honeyguide. “Our project buys what’s left of a cow or goat carcass as a way of helping reduce revenge killings of predators by villagers who’ve lost their livestock.” This transaction helps encourage conservation buy-in from local community members, who also rely on seasonal grazing rights on the ranch. Cattle, goats, and sheep move through the region with their Maasai herders. As much time and effort as it takes to keep the dogs fed, protecting them from the numerous threats that come from working in the bush is even more involved. Snakebites, sleeping sickness (a disease spread by tsetse flies [Glossina sp. ]), heat stroke, and devil thorns are just a few of the risks that can kill or injure the dogs. While the team at Manyara Ranch can find veterinary care in nearby Arusha town, farther afield in the Serengeti, there’s no such luxury. Serengeti National Park must keep veterinarians and veterinary technicians on-site. To see this team in action, I board a small plane that will take me from Manyara Ranch to Serengeti National Park. Just moments after the plane lifts off above the narrow airstrip, the Rift Valley escarpment plunges beneath us. Its wall forms the eastern side of the sunken 14-mile-wide Ngorongoro Crater, which is home to all of Africa’s “Big 5” (elephant, rhino, buffalo, lion, and leopard). For the better part of two hours, the plane skims over seemingly endless yellow plains until finally we touch down in the middle of one of the richest ecosystems in Africa. Stepping off the plane, we’re met by Andrew Mbwambo, the park’s energetic veterinary technician. As it is customary to meet and greet the Chief Park Warden upon arrival, Mbwambo drives us to the bustling park base where Chief William Mwakilema takes a break from a budget meeting to speak with us. He explains how park policy had to be modified before dogs—domestic animals—could be permitted inside a protected area. He also laments how the park—before its partnership with Honeyguide—lost four of its dogs to disease. “The relationship between dog and handler must be like a marriage,” he says. To combat disease, each weekend, handlers wash their dogs in an anti-tick solution. They also maintain fine mesh on kennels and crates that house the dogs when they ride in the backs of vehicles to avoid exposure to tsetse flies. Mbwambo routinely administers sleeping sickness prophylaxis (an intervention originally developed for camels), which requires careful dosing. “Too much, and you’ll kill your dog,” he says. Too little, and the protection won’t work. Every month, blood samples are collected and checked for sleeping sickness antibodies. Purple-blue tsetse fly targets—steeped in insecticide—also hang near the dog kennels to kill the flies. Before going into the bush, handlers apply insect repellent to each dog, and they always carry plenty of water. After all, a panting dog can&apos;t pick up a scent. During a tracking exercise later that afternoon, the team works for about 30 minutes, passing over a wide variety of terrain, from burnt ground to tall grasses and thick bushes. Reimoga, one of the workers who feeds and helps look after the dogs, has hidden himself in one such patch of bushes. But it doesn’t take long for Jerry to follow his fresh tracks and sit under the bush below Reimoga. The dog indicates the hiding spot with directional head movements not unlike the way in which a bird dog might point out a covey of quail. Dog handler Emmanuel Isaack rewards the dog for his work with a bout of play with a rubber tug toy. Poaching of wild animals with snares remains one of the greatest conservation challenges in the Serengeti, and a Serengeti-wide de-snaring program is now in operation. Isaack shows me his collection of dozens of wire snares, which will be destroyed at the park’s headquarters. Unlike in Manyara Ranch, where snares aren’t set for fear of injuring cattle, the greater Serengeti ecosystem is dense with snares. Almost daily, the veterinary technician Mbwambo removes these traps from the legs, necks, and trunks of wild animals. Tracker dogs are used to fight a wide range of illegal activities in Tanzania, but the main focus of these programs is poaching. Animals frequently become entangled in poachers’ snares, even inside protected areas like Serengeti National Park. A lucky few are saved by wildlife managers. What began as a trial with just a few dogs less than a decade ago has become an essential tool in Africa’s conservation efforts. Honeyguide’s tracker dog teams alone have operated throughout northern Tanzania in nine national parks and community-based conservation areas. As word about the organization spread, Honeyguide established kennels in Manyara Ranch and partnered with Tanzania National Parks (TANAPA), the national parks authority, in the Serengeti. Since 2014, their efforts have helped lead to the arrests of more than 20 criminals and to seizures of illicit items including mining equipment, guns, and ammunition. In addition, they’ve collected and destroyed more than 400 snares and have confiscated bushmeat, ivory, and other wildlife products. One recent convert to the conservation dogs model is the Singita Grumeti Fund and Ikorongo Game Reserve complex, a private concession that skirts the western edge of Serengeti National Park. Having called the Serengeti dog unit for assistance on several occasions, they’ve now decided to get dogs of their own. Four rescue dogs—two chocolate Labrador mixes and two Belgian Malinois—arrived in early September. They were trained in detection by Working Dogs for Conservation (WD4C), a Montana-based organization that sources its dogs from shelters. “We wanted to complement the TANAPA facility, which is primarily a tracking program, by adding detection dogs to the ecosystem,” says Grant Burden, in charge of special projects at Grumeti. While Serengeti’s dogs will continue tracking, Grumeti’s dogs will detect wildlife contraband such as ivory, rhino horn, bush meat, ammunition, and pangolin scales. And soon, the dogs will be trained to detect wire snares and poisons as well. Grumeti has taken the dog-handler bond to a new level. With open slats in the walls between the dog kennels and the handlers’ sleeping quarters, the handlers will be able to hear their dogs throughout the night and know if they are in distress, Burden says. The grassy outdoor kennels are fed by rainwater, and the dogs will have canvas beds elevated above the floor. In addition, the kennel will have its own basic veterinary laboratory equipped with a centrifuge and a microscope to monitor dogs’ health. As the number of tracking and detection dog programs continues to grow across Africa, a few key elements will be necessary to maximize the achievements of canine units: setting and maintaining standards and best practices, long-term donor support, and importantly, sharing knowledge and even resources. “In conservation, we have limited resources,” says Damian Bell, Honeyguide’s executive director. “While dogs are expensive to maintain, they have proven effective at helping government and community ranger teams curb poaching and crime.” Bell estimates that it costs at least $30 thousand per year to maintain an established dog unit. The rationale is that if dogs are helping to keep the region’s protected areas, campsites, and communities safe, they are not only fostering positive attitudes toward conservation, but also helping secure a vital sector of Tanzania’s economy. Tourism is a mainstay in the country where the northern circuit—together with the islands of Zanzibar—generate some 90 percent of the country’s $1.3 billion in tourism earnings annually. These funds help subsidize Tanzania’s lesser-known and more remote national parks. “We spread the word about the dogs through the people we train in crime-scene protection,” says Kirimbai, who was a member of Tanzania’s original anti-poaching unit established in 1978. “Sometimes this training—in how to leave a scene undisturbed so that the dogs can do their work—can be enough to deter illegal activities.” In other words, the people he trains become message multipliers. “There are no secrets in Tanzania,” he says. magazine. 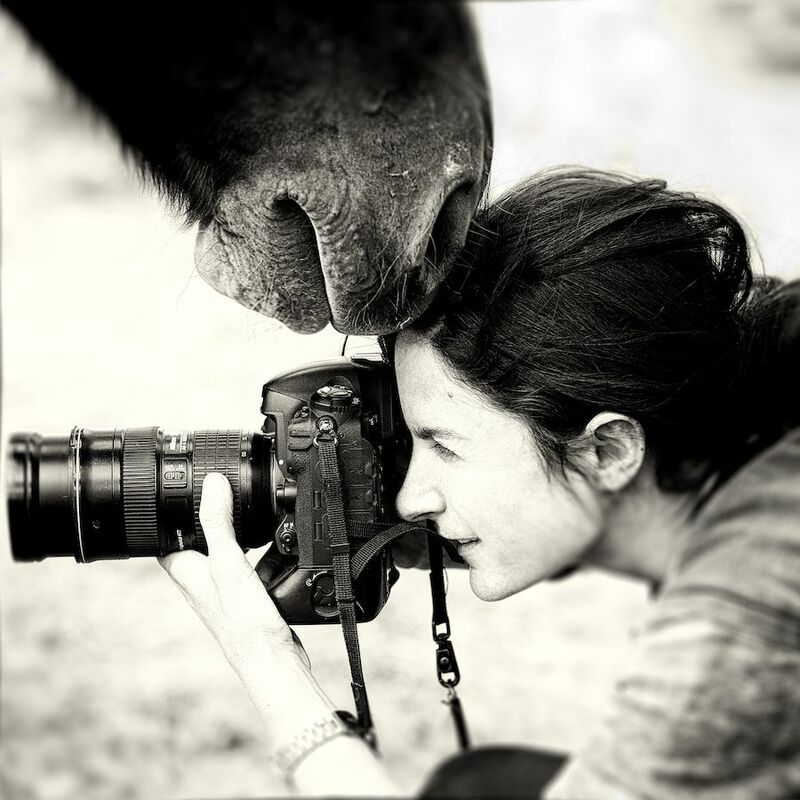 She has garnered prestigious awards including the first Magnum Inge Morath grant along with multiple prizes from World Press Photos, the International Photographer of the Year prize, the Daniel Pearl Award for Outstanding Reporting and named Magazine Photographer of the Year by the National Press Photographer&apos;s Association. She is based in Montana. In the harsh, hot soda lakes of East Africa, flamingos thrive, and now scientists are beginning to understand how these birds live where other species die.